Accessing an HTTP server on the Internet is effortless. You are doing so now as you read this webpage. You may need to enter a username or password for some sites, but it really couldn't be easier. 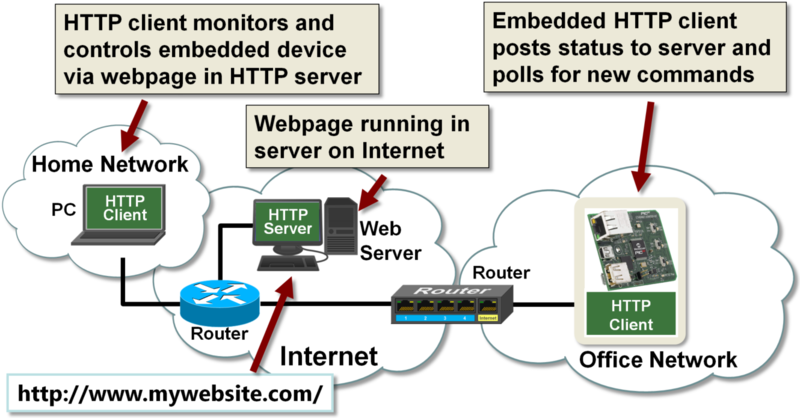 In this example, the webpage that controls and displays the current state of the board runs on an HTTP server in the Internet. The embedded HTTP client posts its current status to the server and polls for new commands. A web browser on a PC or smartphone can monitor and control the embedded device via the webpage in the HTTP server. The server may be implemented on a shared web hosting service from a company like godaddy.com or networksolutions.com, or may be implemented in the cloud, which is a service of decentralized servers from companies like Amazon, Google, or ioBridge. These service providers will allow you to choose a website name so your webpage can be easily accessed. Instead of locating our HTTP server on the Internet, we could instead locate it on a local network. In this case, the webpage that controls and monitors the embedded device is actually running on the embedded device. Just as in the previous case, a web browser on a PC or smartphone can monitor and control the embedded device via the webpage running in the embedded HTTP server. Servers on local networks have some challenges that internet servers do not have.